For my Master's thesis, I designed and implemented a social networking site for high school students to share their EarSketch projects. EarSketch is a NSF-funded project at Georgia Tech that aims to teach students Computer Science concepts through programming in the context of making music. 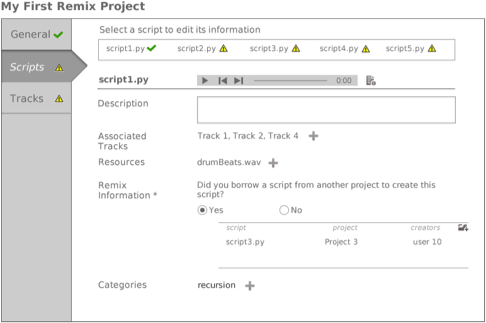 Students learn to code in Python as a way to create and remix music using the API for a DAW(digital audio workstation) software. The website I developed was first used during a 3-week pilot workshop for high school students. It was a place where students shared and remixed each others' projects. One of the most important thing to design was the structure of an EarSketch project. I wanted to include all the necessary information so that students could easily find relevant projects and learn from each others' code snippets. Each project also needed to preserve its remix history as a way to recognize the authorship of remixed materials. A diagram showing the structure of an EarSketch project. Wireframe of a project page. Since the success of the site depended on the students creating and sharing projects, I conducted user testing with a prototype to ensure the project creation process was easily understood. I was able to make improvements based on the feedback I collected. Gathering general information about a project. Providing information on the code written for the project. Providing information on all the tracks included in the project. I implemented the site using CakePHP and MySQL. Landing page for the website. General information about a project.